The Halifax Jazz Festival takes place over five days in July. 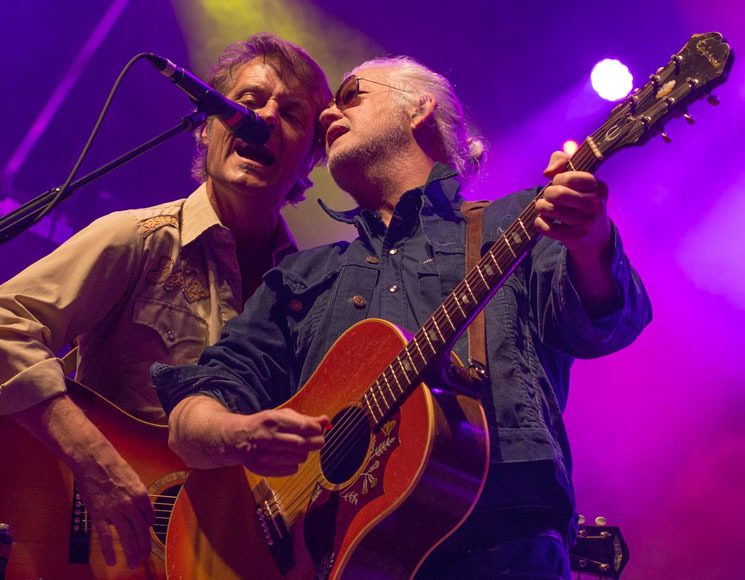 So while it risked being a bit on-the-nose, Blue Rodeo bookending their headlining show Friday night (July 14) with favourites from 1993's beloved record Five Days in July felt like a perfect fit. The show opened with "Five Days in May" and "Cynthia," the songs' softer sides giving way partway through to impressive solos from band members Mike Boguski (keyboards) and Colin Cripps (lead guitar). And the main set closed with classic "Hasn't Hit Me Yet," which the sizable audience knew so well that Cuddy and Greg Keelor could step away from the microphones and let the crowd handle the first verse and chorus all on their own without missing a word. "Blue Rodeo just turned us into 'wooo!' girls!" I overheard one concertgoer saying early in the set. And it's true: the instant familiarity of the band's best material and the sense of comfort in their sound — even at its most ragged — makes theirs a show easy to cheer for, and even easier to sit back and soak in. Admittedly, a festival crowd probably wasn't the ideal setting for some of the set's softer sides: if a slow song wasn't an obvious hit (for example, Lost Together ballad "Is It You," one of many examples of Keelor's stirring vocal performances), it was drowned out in cacophony of buds catching up over beers. But with a bit of work, the band found moments of silence to fill. A fantastic, slow-building "Disappear" in particular, seemed to hush the crowd enough for the band to ably roll back in with a forceful, pointed outro. But the moments the audience almost certainly went home remembering (if they didn't "catch up" too much, that is) will be the sing-alongs: great performances of iconic songs like "What Am I Doing Here," "Try" and a transcendent "Lost Together." On the last of these, which ended the night, the band invited opener Ron Sexsmith and his band along with Haligonians Rose Cousins, Matt Mays and Adam Baldwin on-stage to sing along. Baldwin, Sexsmith and Mays each took a verse, and when the chorus hit it felt like everyone on the harbourfront was part of the choir. Even if you've heard it all so many times before, the song — one of the best to ever come out of this country — has rarely sounded better. Pick up Five Days in July on vinyl via Umusic.